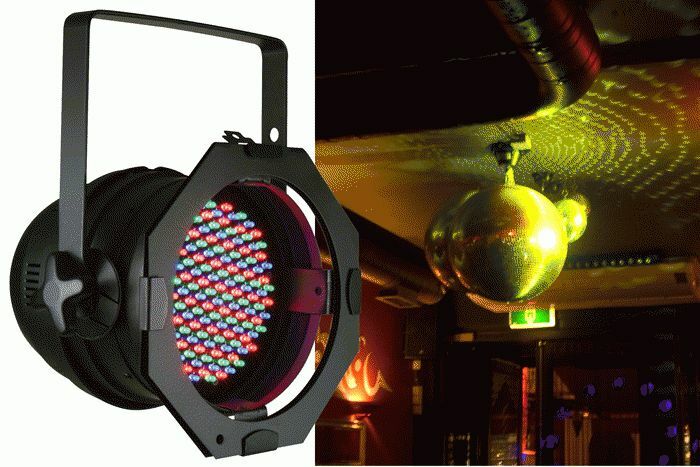 American DJ has made its popular P64 LED par can even better! The company has added Master/Slave capabilities to this award-winning RGB-mixing LED par can with the introduction of the upgraded P64 LED Plus. Now, all it takes is a 3-pin XLR cable to link multiple units of the fixture together, and they will all follow a "master" program -- allowing users to produce a synchronized light show with ease. Like the original, the new P64 LED Plus also operates in stand-alone configuration if preferred. Also like its predecessor, which won the 2005 DJZone.com Crystal Disc Award for Technical Innovation, it features full RGB color mixing. The DMX-compatible par can comes equipped with 151 bright 5mm LEDs (51 red, 49 green, and 51 blue), allowing you to create a virtually infinite palette of colors and to constantly change colors on the fly. "The original P64 LED truly revolutionized stage and club lighting when we first debuted it in 2005,” said Scott Davies, General Manager of the American DJ Group. “Unlike traditional halogen par cans, which produced a limited number of colors using inconvenient gels, the P64 LED could create literally millions of colors via RGB mixing at the touch of a DMX controller. Great for DJs, clubs, concerts, stage productions, churches, displays and special events, the P64 LED Plus can operate in 4 modes: Sound Active, Active, RGB and DMX Control. It features Electronic Dimming from 0 to 100%, a color strobe effect, and the option of fast or slow color change operation. Like its ground-breaking predecessor, the P64 LED Plus’s state-of-the art LED technology blows away any halogen pan can competitor. Its LEDs operate at a very cool temperature, unlike traditional halogen par cans, which emit a plethora of heat, causing discomfort for stage performers. Traditional electricity-hungry pars can also drive electric bills skyward toward the stratosphere, whereas the P64 LED Plus’s energy-saving LEDs consume a mere 24W maximum. Another huge advantage is the enormous life span of the P64 LED Plus’s LED lamps, which are rated at an impressive 100, 000 hours. The P64 LED Plus features a beam angle of 30 degrees, uses 6 DMX channels, and includes a built-in microphone. Like its predecessor, the P64 LED Plus weighs only 5 lbs and includes a hanging bracket. Its dimensions are 11.5"W x 10.5"L x 13.5"H.
Offering multi-voltage 120V or 220V operation, the P64 LED Plus carries a lengthy 3-year limited warranty. The MSRP of the P64 LED Plus is $219.95.